Today's Vocabulary Word: Ga, as in Ga Ga. No, this has nothing to do with Lady GaGa or the sounds a baby makes when first learning to speak! The term "ga" comes from the Hebrew word hit or touch. Thanks to the work of Bullhead City's Mohave County Juvenile Court Community Advisory Board (CAB), Mohave Valley Jr. High will now have a Ga-Ga Ball Court. The game, originating in Israel is dubbed as a kinder, gentler version of dodge ball, and combines the skills of dodging, striking, running, and jumping while trying to hit opponents with a soft, foam ball below the knees. Players need to keep moving to avoid getting hit. Know as GaGa (or hit-hit), the game begins with a player throwing a ball into the court where it must hit or touch the ground twice. The CAB purchased the kit and partnered with Medhi Azarmi of Fairway Constructors, who is supplied the wood and the labor for construction. Once constructed, probation youth will paint the pit as part of a CRS project. 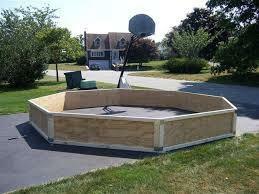 The GaGa pit should be constructed and ready for action when the students return to school in August. Thank you to Mehdi Azarmi, and Nancy Mongeau, who leads the Bullhead City CAB for their work to bring this donation to Mohave Valley Jr. High!